Malted rye has no husk. Hoppy cough syrup. That is how I describe the results of my first attempt at brewing a 100% rye pale ale this past year. This week, I took another stab at the style, reducing the gravity and hoping that the viscous nature of the rye would give me a low gravity beer with a satisfying and substantial mouthfeel. I first decided to brew a beer based on nothing but malted rye after having several successful attempts at brewing 100% wheat beers. Both malted rye and malted wheat have enough diastatic power (enzymes) to convert the starches to sugar in the mash without the help of barley. The trick is getting the wort to run out of the mash after the rest. 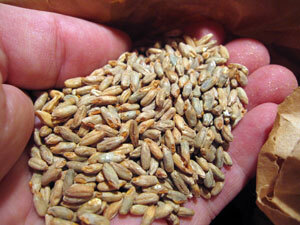 Neither rye nor wheat have husks. Barley does, and the husks act as a filter bed that allows the wort to run through and out to your kettle. Fill your mash tun with nothing but rye or wheat, and you’re likely to have a nice tub of goo at the end of your mash rest with all the water and sugars still locked in. Abandon your traditional mash tun for a nylon bag, and you’re in business. Brew in a Bag is the ever-more-popular brewing technique of Aussie decent that calls for lining your brew kettle with a nylon bag and mashing inside it. At the end of the mash rest, the bag (and grain) is removed from the wort instead of the other way around. Get a stuck sparge? Hang up the bag, get some heat-resistant rubber gloves, and give that thing a squeeze. 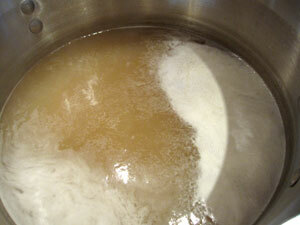 You can also sparge the grain bag in a second pot of hot water to loosen up the leftover sugars. 100% rye wort is pretty slimy. My first rye pale ale had a starting gravity of 1.055. Four pounds (1.8 kg) of malted rye went into the two-gallon (7.5 L) batch. The wort running out of the bag at the end of the mash rest had the consistency of goat snot. It was very slimy, and it took a long time to collect it all. After chilling, the proteins didn’t settle out, and the wort remained cloudy. The resulting beer looked normal — if you live in a slow-motion world. After pouring, the bubbles took their time rising up through the viscous beer. The flavor was good, but the mouthfeel was more Nyquil than pale ale. My thinking on this week’s attempt was that the viscous nature of the rye could work to my advantage. If I backed off on the amount of grain by half, then perhaps I’ll end up with a beer with the mouthfeel of a regular beer, but with half the gravity, alcohol, and calories. If I can add some tasty hops to that mix, then maybe the springs on my bathroom scales won’t complain as much. For the first beer, I chose Amarillo. For this one, I went with Citra. The gloppy rye didn’t let allow sparging. Since I only had a couple of pounds (0.9 kg) of grain to deal with, I decided to ditch the bag. My plan was to mash in a kettle, then scoop the grain from the mash into a colander over a second vessel, pouring the remaining wort and sparge water through it. I’ve done this technique several times, but this time the rye was so sticky, that no wort or water would go through. I brought the bag out of storage, lined the brew kettle with it, and poured the wet grain and wort into it. After removing the bag and draining out most of the wort, I put the bag into another pot with a gallon (3.8 L) of sparge water. I stirred the grain in the sparge water, which loosened up the gloppy stuff quite a bit. I added the second runnings to the main kettle and started the boil. From there things progressed pretty much as a normal batch of beer. I added hops at the sixty- and five-minute marks. The only difference was that the proteins in the wort again failed to settle after chilling. I poured the whole lot into a Mr. Beer fermenter and pitched US 05 dry yeast. That’s where it sits now. The beer seems very happy. Fermentation is active, and the smell from the closed (but vented) lid is encouraging. My only worry is that I may have over-hopped it. The wort is pretty bitter. Time will tell if that’s a good thing or not. The recipe and the episode of Basic Brewing Video featuring the original beer are below. I’ll keep you posted. Bring two gallons (7.5 L) water to 156˚F (68.8˚C) in kettle. Add nylon Brew in a Bag bag and check temperature again. 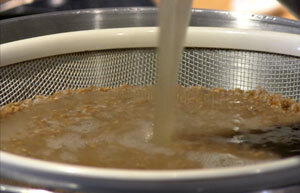 Add malted rye and mash at 151˚F (66.1˚C) for one hour. In the meantime, heat one gallon (3.8 L) water in a separate pot for sparging. Remove the bag after the mash rest and allow wort to drain (you may squeeze if you wish). After most of the wort has run out, put the bag into the sparging kettle and stir the grain. Remove the bag again. Combine the second runnings with the first runnings in the main kettle. Bring wort to a rolling boil and add hops as described above. Chill to pitching temperature, pour into sanitized fermenter, and pitch yeast. This pretty much explains my average brew day! Though, I’ve never done an all rye beer. I’ll be interested to hear how it turns out. With all that viscosity, I wonder if Rye isn’t a good candidate for a lower gravity braggot. I, too, have brewed a few 100% wheat beers without incident. I applaud your attempts at similar beers, but with rye. I wonder if a beta-glucan rest might aid your issues with sparging and “goat snot” viscosity. I considered that this time, but I didn’t want to change more than one variable. This one is considerably less snotty. Looks like a good test vehicle for that free vial of White Labs’ Clariferm we all snagged at NHC! Rye Is full of beta-glucans, that is what makes it so slimy, and can transfer through the brewing process into the finished beer. You should try to do a step mash, starting with a long-ish Beta-glucan rest at 120-130 for about 20-30min, then do an infusion step to get up to mashing temps. Also if you are milling, double mill your rye to get it good and broken up for maximum wetting during the mash. Good info. I think adding a lower initial rest is a good idea if I don’t like the mouthfeel of this lower gravity beer. However, I’m hoping at this lower gravity, the syrupy characteristic will be pleasant. Stay tuned . . .
All that said, I didn’t know you could do 100% Rye, might try this. I love Rye. I’d love for more brewers to experiment with all-rye beers. It could be a style that would be almost exclusively a homebrew style because of the extreme difficulty in brewing a commercial scale batch. I think it has been done by at least one pro brewery, though. Think your all rye is cool. I’d do a 1 hour of what Bryan Boyd says at whatever the best temperature for breaking up goat snot. Longer time, lower temperature is often good. I might try (not doing this yet) dumping in clean sterilized cold water to the hot rye wort always coming from a nylon Aussie bag! Hey James, I took inspiration from this and had a bash at a rye session beer too. I’m not really set up for BIAB though, or doing smaller batches, so I decided on a 50% Rye beer instead. I put 50% maris otter with it to bring it up to a 5 gallon batch and to help with the lauter. I also decided on a belt and braces addition of oat husks, just to ensure I didn’t get a stuck sparge. On the day, I had no problems and I wrote up the day on my blog: http://bbobsbblog.blogspot.co.uk/ Now I just really want to drink it! Thanks for the ideas and the great shows, keep ’em coming! I am writing an ebook on beer recipes and home brewing. I was wondering if I have permission to use this recipe in the book? I will of course credit you on the recipe.